If you’re an avid hunter, you’re likely already familiar with the Danner name. They’re a well-respected manufacturer of hunting boots, but they’re not always considered the most contemporary brand. The Pronghorn is their attempt to modernize their image. It’s an updated version of a classic boot with a more streamlined design and state-of-the-art features. My favorite aspect of these boots is the durable, high-quality construction. They have full-grain leather upper, toe and heel cap. Leather construction allows the boots to conform to your specific foot shape. The CamoHide leather upper is a hallmark of Danner boots. It’s augmented with 1000 Denier nylon. This lightweight, durable nylon is one of the boot’s new features. I found these boots to be extremely comfortable. The Ortholite footbed uses three-density, open-cell polyurethane to support each foot’s unique pressure points. Plus, GORE-TEX lines the inside of the boot. Your feet will stay dry and comfortable without overheating. The GORE-TEX allows air to flow around your foot. Moisture is quickly wicked away to keep the interior dry. Since the beginning, Danner boots have featured a TERRA FORCE platform. It’s a rugged outsole which provides solid traction even in slick and uneven terrain. However, new rubber compounds added to the outsole provide additional grip. I felt sure-footed at all times when wearing these boots. I also liked the fit. The boots use pull loops with semi-locking laces. Once the leather was broken in, I found the Pronghorns to be some of the best fitting boots I’ve ever worn. My main complaint doesn’t have anything to do with Danner specifically. But leather boots of any type do require a break-in period. They were stiff and uncomfortable for the first few days of hiking. You won’t be able to take these boots out of the box and immediately wear them out in the wild. On the plus side, the boots were broken in after just two days of wear. The leather conformed to my feet for a one-of-a-kind fit. Unfortunately, leather boots require some patience before they’re ready to use. Another potential problem is how wide these boots are. Obviously, the extra room is ideal if you have wide feet. But if you don’t, the boots can feel too big even when properly sized. My toes tended to rub against the inside of the boot. While thick socks seemed to prevent chafing, I feel like this extra room could be a problem after months or years of use. While I liked the semi-locking laces, they do result in some minor water leaking. A boot made completely out of synthetic rubber typically doesn’t have this problem. But rainwater did manage to get inside these boots through the eyeholes. Finally, I’m a bit suspicious about the construction of the heel. It showed slight signs of peeling away from the main part of the boot. 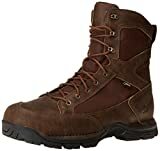 The overall quality of the boot seems solid, but it’s still a downgrade compared to the quality of older Danner boots. Customers consistently praise the overall quality of the boots. Brian Z said he buys a new pair of Pronghorns every ten years. He remarked on their long-life and durability. I never expect hunting boots to last more than five years, so anything beyond that is a pleasant surprise. User DJA said the Pronghorns are an excellent combination of support and durability. However, he also said they do require a break-in period before they’ll conform to the shape of your feet. But that’s to be expected for just about any leather boots. User DEER said he broke his boots in after just one weekend of wear. While the majority of users were impressed by the quality of the leather, there was significantly less praise for the look of the boots. Buyer rcl said his boots scuffed easily. Brian Z. said his boots quickly looked worn and old even after just a brief period of use. These boots might not be much to look at, but most people find them comfortable. One unnamed customer said his boots were as comfortable as a pair of sneakers. Buyer middle.age.landsurveyor said the boots were lightweight and didn’t tire out his feet or legs even after a long day of hiking. However, he also said these boots are far from waterproof. As an owner of many different pairs of Danner boots, he said leaks have always been a consistent problem with the brand. While your feet will likely stay dry in the rain or snow, you’ll want to avoid walking through puddles or other bodies of water. Is Danner attempting to coast on their past successes or do these boots successfully offer a modern twist on a classic brand? Well, it seems to be a bit of both. The overall quality is high. Danner boots are handmade by experts. They seemed designed to last a lifetime. Plus, these boots are warm and comfortable. Once the leather is broken-in, they’ll conform to your feet to help prevent blisters and chaffing. Plus, the three-layer footbed cushions your feet and prevents shock. However, the boots are also wide. If you have narrow feet, you’ll need to wear thick socks or else the tops of your toes will likely rub against the upper part of the boot. Also, I’d consider these boots water resistant but not waterproof. If you step in a puddle, your feet and socks will likely get wet. They’re not well-suited for hunting near lakes or rivers. Overall, I’m not overly impressed with the upgrades. But these are still well-made boots which resist damage and stay comfortable. They’re a good choice if you’re looking for all-season hunting boots built to last for many years.